What to do in Madrid? Here are six must-see attractions for visitors. 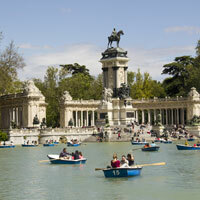 If you're heading to the Spanish capital make sure you don't miss any of these attractions. One of Europe's greatest urban parks, El Parque del Buen Retiro is a popular retreat for locals to get away from the heat of the city. Filled with wide promenades, rose gardens and fountains, it's the perfect spot to while away an afternoon. Hire a rowing boat and head out onto the majestic Great Pond or wander down to the Palacio de Cristal, a glass house inspired by London's historic Crystal Palace. Think you have to go all the way to Egypt to see an Egyptian temple? Think again. The Templo de Debod, located just north of the city's majestic Royal Palace, dates from 200BC and was gifted to Spain by Egyptian authorities back in 1968. A popular spot for people-watching, the temple is also one of the best places in the city to experience the sunset. There's no better way to get to know a city than with your taste buds and Madrid has a number of excellent food markets just waiting for you to tuck in. Our favourite is the Mercado de San Antón in the gay neighbourhood of Chueca, a lively food hall set over four floors with plenty of stalls and a rooftop restaurant with views over the city. Home to Real Madrid, one of Europe's most successful football clubs, the Santiago Bernabeu stadium is a must-see for any sports fan heading to Madrid. Stadium tours take visitors all around the impressive arena, which hosted the 1982 World Cup Final, from the trophy room to the pitch where Gareth Bale and his teammates compete for glory. Located at the heart of the old city and dating back to the 17th century, Madrid's Plaza Mayor is one of Spain's most impressive squares. Once the host of football matches and bullfights, these days the square is the more sedate setting for Madrileños and tourists alike to sit down, grab a beer or coffee and watch the world go by. Madrid's number one tourist attraction, El Prado is also home to one of the world's greatest collections of European art, including works by Francisco Goya, Diego Velázquez and Rembrandt van Rijn. Located in the city's museum district, make sure you arrive early (or late) to avoid the worst of the queues as El Prado gets very busy. If you're travelling to Madrid, it's essential to get cover that fits you and your plans. Here at World First we offer dedicated travel insurance cover for families that'll give you peace of mind when enjoying the best Madrid has to offer.